A satisfying conclusion to the Graviton story, although the resolution of Rogue’s brief brush with madness at the climax is a little abrupt. The story celebrates teamwork, which is what the Avengers are all about. And the words “Fantastic Four” are actually uttered! Johnny Storm is a welcome member of this team, but it would be nice to have him back where he belongs. The subplot where an attorney is trying to catch up with him, and surprises him at the end of a boxer-clad battle, is appropriately funny and mixes the mundane with the fantastic in the way the best Marvel tales always have. I’m reminded of the first appearance of Henry Peter Gyrich (although that was more sinister) or the earlier Avengers tale in which Janet Van Dyne (the original Wasp, and still a member of this team) inherited her father’s millions. I’ve made no secret of the fact that I’m not much of a fan of modern comics. I don’t like the pace of the storytelling, where everything is so obviously plotted to fill a six-or-twelve-issue trade. Often nothing significant happens in a single month’s issue, and even more often, the thirty-day wait between issues in which the plotting is more suited to a daily soap opera causes me to forget what happened before, and I lose the thread of the story entirely. This is intentional, I’m sure. Comics publishers want buyers to pick up the individual issues to stuff in bags and collect, and save reading for the trade paper edition, which they think we’ll also buy. Stupidly, a lot of us do buy each issue and the collected edition that comes out within days after the final issue of a story arc. Indeed, sometimes the trade beats the final issue to the stands. I was cautiously optimistic when it was announced that a new book called Uncanny Avengers was coming out. 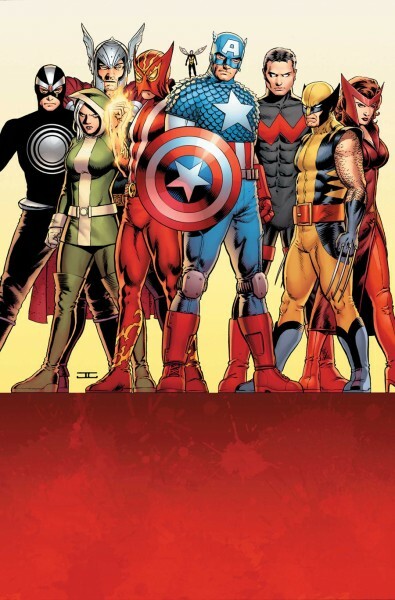 It had a cast featuring both Avengers and X-Men, and it prominently featured Marvel second-stringers Havok, Rogue and Scarlet Witch alongside Captain America, Thor and the annoyingly omnipresent Wolverine. I was, unfortunately, so disappointed with the opening four-issue story arc that I was going to stop reading the book. It was full of characters blaming the Scarlet Witch for the fact that she was badly written by Brian Michael Bendis, it featured the corpse of Professor X being hauled around with the top of his head missing, and it featured unnamed characters being killed with no notice or mourning. It just wasn’t what I wanted to read. I won’t give the details of the ending and how it bothered my son. Suffice to say it involves death and surprise, but I pretty much glossed over it. It’s an easily undone death. The issue was low on shock, high on characterization, and featured the return of light-hearted characters Wonder Man and the Wasp. It bodes well for the future of the series. It’s a wonderful rejection of group-think. Havok is standing up and saying, “I’m a person, not a label. Don’t use the label, because it tends to make you think of me as something other than a person. My identity is mine, not some group’s, and you may call me by the name which identifies one unique individual.” Such individuality is refreshing in a day when we only seem to want to recognize people as parts of groups, not as individuals. I support marriage equality, and I appreciate the thoughtful arguments of friends who think it’s appropriate to keep using the term “gay marriage,” so that we don’t forget what it is that some people are trying to deny, even though we don’t say, “I’m getting straight married.” I think that’s a good point. But that’s labeling a concept, a practice, not a person. Labels are dangerous, because people become obsessed with them. They make it too easy to pre-judge and say, “That person meets this criteria, so I can dislike him without investigating further.” That’s something we shouldn’t allow ourselves to say. The speech made by Havok herein makes a stab at letting people know that, and I congratulate the writer, Rick Remender. Keep writing issues like this one, Rick, please!